When we lived in Japan, I used to make our lunches for the following day every night after dinner. I haven’t done that as much since we’ve been home-must have just been one of those things that got lost without a regular routine for a while there. Despite my lack of keeping up on lunches as of late, I’ve started to get back into meal planning, and I’ve decided the lunch-making habit would be a good one to start up again, too. Tonight I just threw together a very simple bento with some random things I had in the house: peanut butter on celery sticks, cheese cubes & a couple of cherry tomatoes, baby carrot sticks, leftover pork chops that my mother-in-law made (amazing, by the way! ), saltine crackers, and a boiled egg. Lots of color–which is always important!–, lots of variety, nutrients, and protein. (I was very excited to use some of the things I stocked up on before leaving Japan!) Should keep me nice and full! What are some of your easy lunch ideas? Captain America: Well, what about you and Stark? How do I know you two haven’t been fondue-ing? Agent Carter: You still don’t know a bloody thing about women. I’ve been meaning to try fondue for a while now, and this weekend, we finally gave it a go! 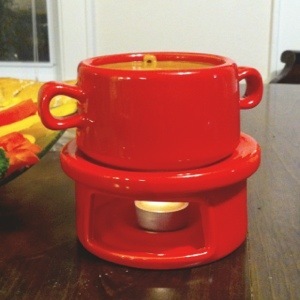 I borrowed a cute little fondue pot I brought my mom for Christmas from Japan a few years ago, and set to work making a cheese recipe I found on this fondue website. We dipped bread, steamed broccoli, red & yellow bell peppers, grilled zucchini and gnocchi into our cheese. I got the idea to use gnocchi from my sister-in-law, who said she had it at a recent fondue dinner party she attended. The meal was SO good, but we ate way too much! 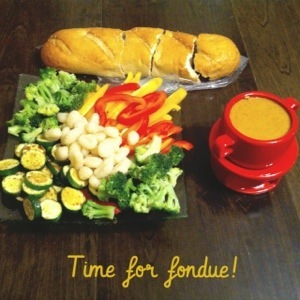 What kinds of fondue have you tried, and what kinds of food did you dip in it? 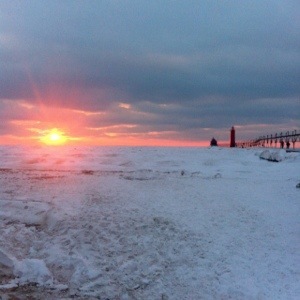 Today I got to see the frozen lake at the Grand Haven beach first-hand. We walked from downtown all the way to the pier, and then walked straight out onto the ice. It was so amazing to see the way the lake froze, especially when we took a chance to look over at the lighthouse and see how far out on the water we actually were (admittedly, it was also a little scary!). The sunset was gorgeous. Nature so often leaves me in awe. 2. I got a new Gratitude Journal that I’ve been filling out daily. 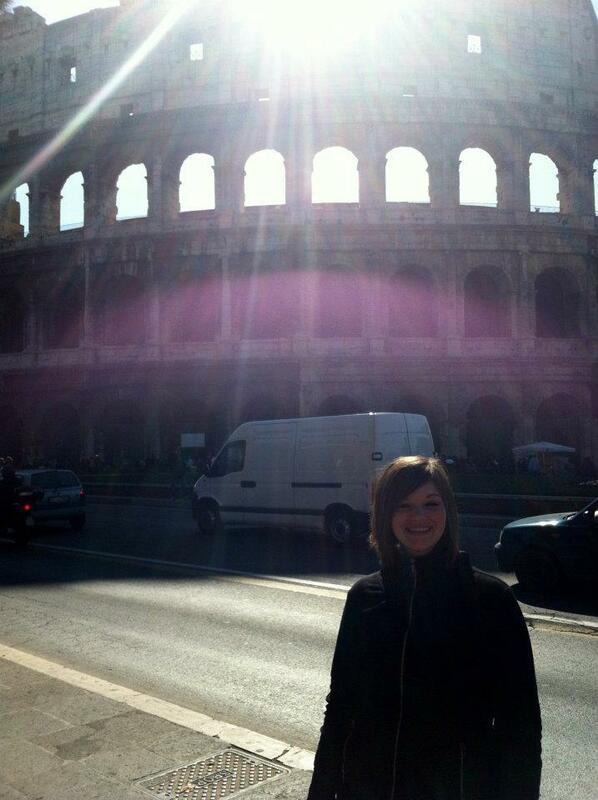 I loved looking through the one I did throughout 2013–I have so much to appreciate! I also bought a Q&A book that asks a different question every day. You can see how your answers change over five years. 3. Chad and I have been trying to have creative time together every day, even if we’re super tired! He started working on carving some nice soapstone he got for a Christmas present. 4. While he worked on his carving, I did my first WhimseyBox craft! To be honest, in high school I hated working with clay, despite loving pretty much every other art medium. But working with dry clay to make this pretty little dish was easy and fun. Plus, I have lots of leftover clay and am inspired to make other pretty things! 5. I made banana bread and it turned out super yummy! 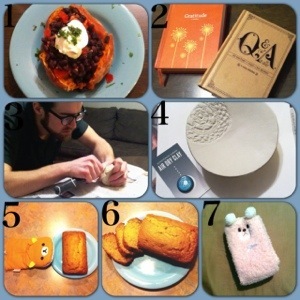 I took the first picture mainly to show my amazingly adorable Rilakkuma oven mitt. 6. I took the second banana bread picture to show you the lovely moist texture of the bread. Served warm with butter? Delish! 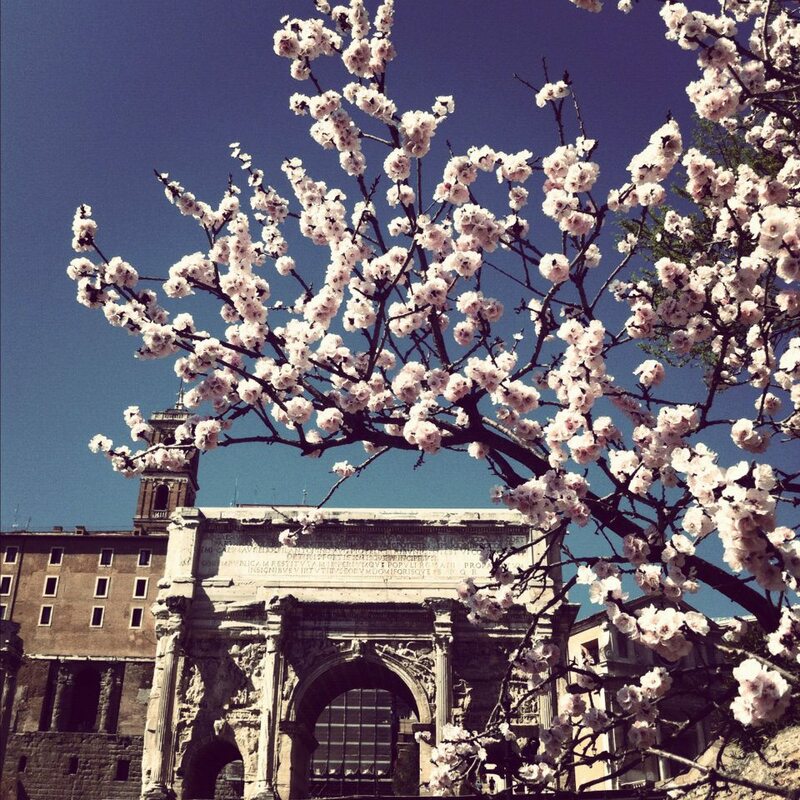 What are some random things you’ve been enjoying this week? 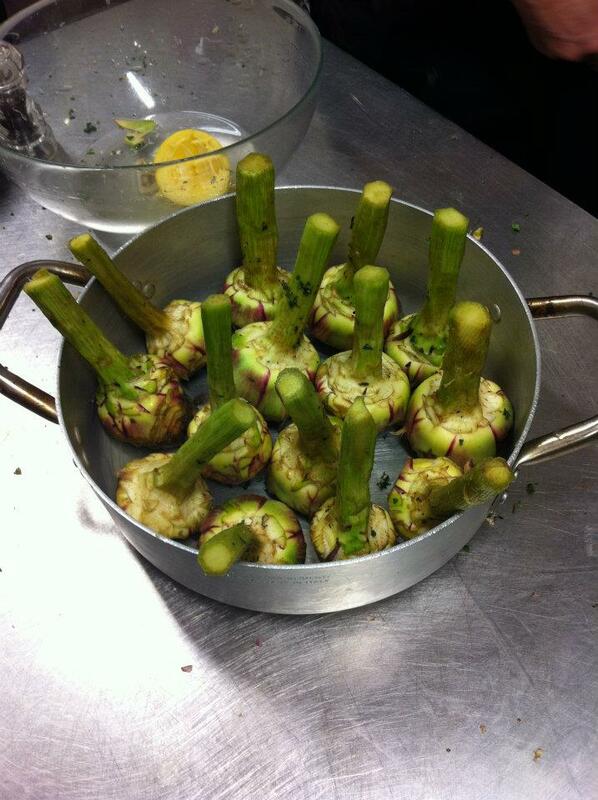 One of my favorite things we learned to make in our cooking class were Roman Style Artichokes. 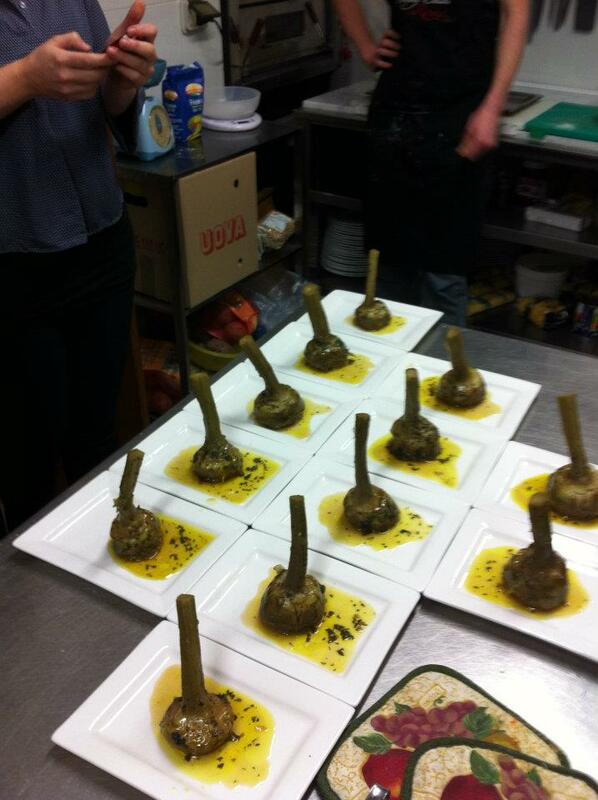 We started out by carving the artichokes, which is a lot harder than you might think! 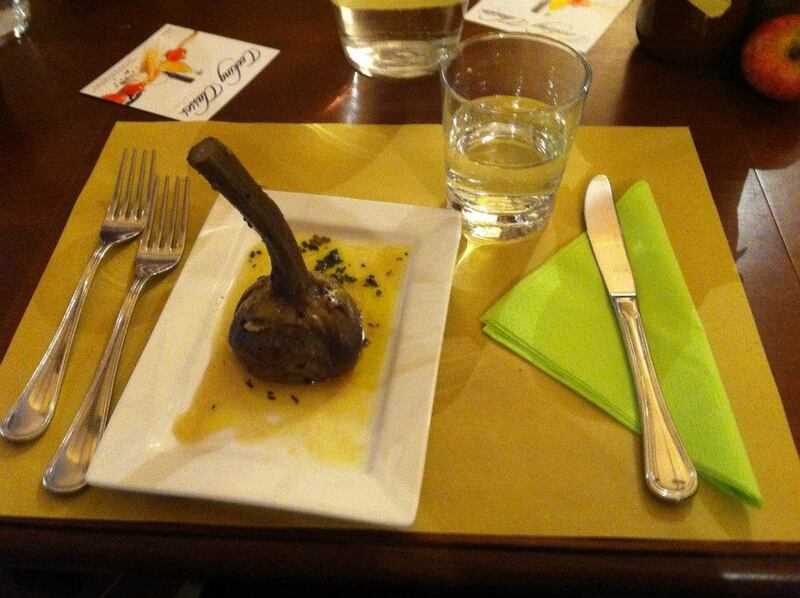 After carving the artichokes, we rubbed them with lemon and stuffed them with garlic, Roman mint, salt and pepper. Then we put them in a pot with olive oil and water and cooked them until they were tender. 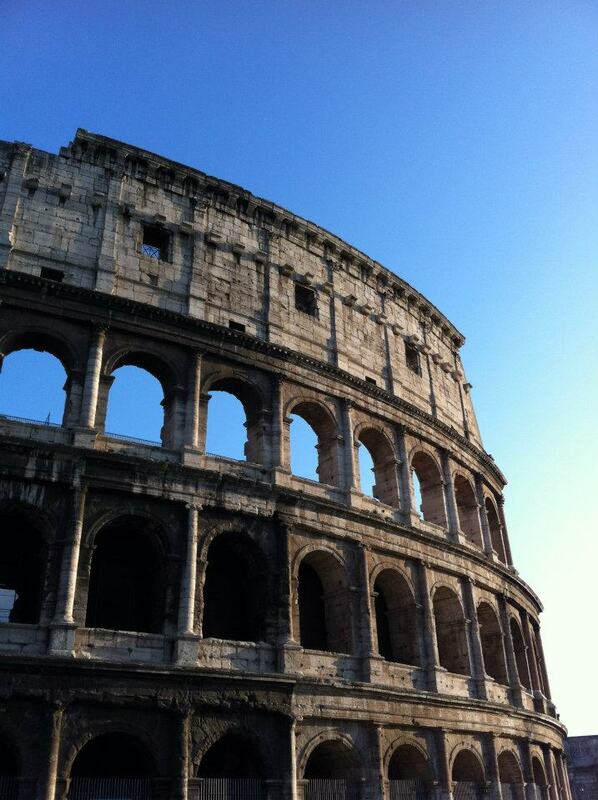 Believe it or not, before taking the Cooking Class in Rome, I had never tried artichokes (aside from in Spinach Artichoke Dip). 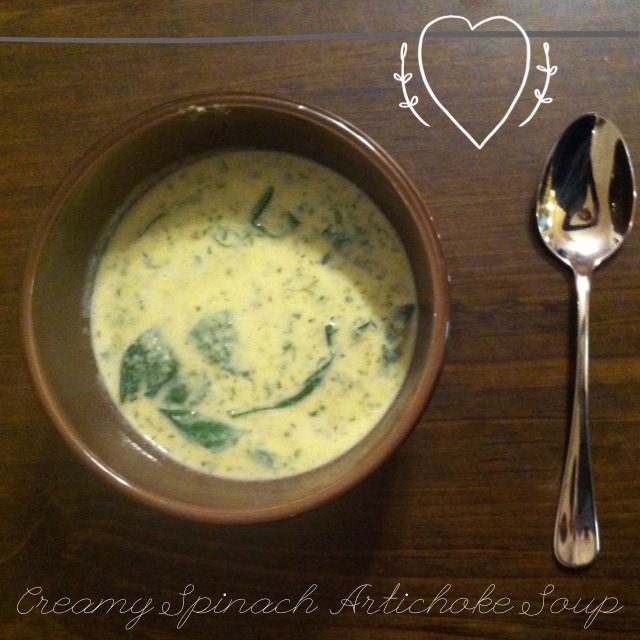 I was very excited about trying a new food, and remembered our trip fondly today when I decided to try artichokes in a new way for dinner tonight: I made Creamy Spinach and Artichoke Soup! The soup has a very unique flavor–the lemon juice and dill gives it some tang, and almost reminds you of spring. Adding a fair amount of Parmesan cheese before eating will add a great deal to the flavor and calm down the citrus if it seems a bit strong. I got the recipe out of a fabulous cookbook called Eating Well Serves Two. I used the cookbook a lot while in Japan and always appreciated the variety and healthfulness of the easy-to-make meals. If you’d like to give this Greek soup a try, find the recipe below. 1. Bring broth and rice to a boil in a large saucepan over high heat. Reduce heat to a simmer and cook, uncovered, until the rice is very tender, about 15 minutes (since I used whole grain rice, it took about twice as long). Stir in spinach. 2. Place artichoke hearts, eggs and lemon juice in blender; cover and puree. With motor running, ladle about half of the rice mixture into the blender and puree until smooth. (Use caution when pureeing hot liquids). Return the pureed mixture to the pan and cook, stirring constantly, until an instant-read thermometer registers 160 degrees F, reducing the heat as necessary to prevent the soup from boiling. (I didn’t have a thermometer, so I just cooked it for a while until it got frothy while stirring.) Stir in dill and pepper. Makes 2 servings, 2 1/4 cups each. Chad got busy drawing out ideas for his cat tree, and then kept his “blueprints” in mind as he headed to a local Re-Store for parts to make the cat tree. 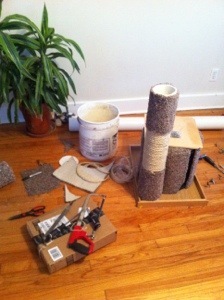 Using wood, PVC pipe, buckets, a rope spool, carpet and rope, he was able to construct a very professional-looking cat tree. 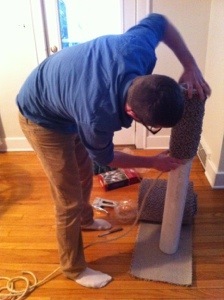 Above, Chad is wrapping rope and carpet around a pipe. Curry was enjoying the cat tree before it was even finished! It only took Chad about four or five hours to construct this lovely cat tree, and the cats started enjoying it immediately! Curry and Comet enjoying their new cat tree. 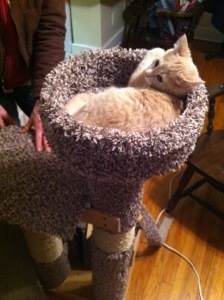 Chad enjoyed making the cat tree so much, that he made another one for my mom as a Christmas present. 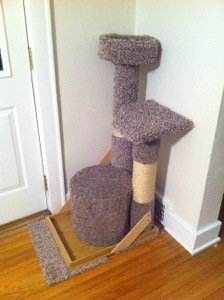 The usual cost of a cat tree? Prices usually start at $80 for small ones. The cost of ours? About $30. It just goes to show that with a little creativity and time, just about anything is possible! 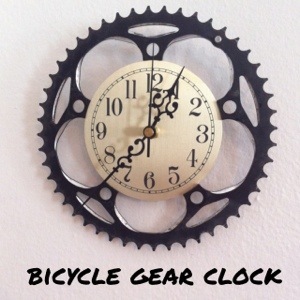 A couple months ago I came across a DIY project for a clock made out of a bicycle break disc that I decided would make a great Christmas present for Chad. 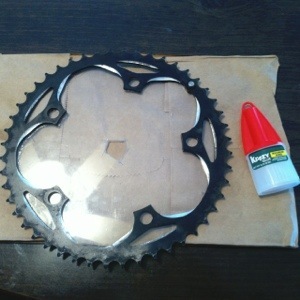 A month and a half later, I totally forgot what part of the bicycle I was supposed to use, so I asked my brother-in-law if he could get a hold of “that one part of a bicycle that you wrap the chain around.” He was like, “You mean the gear?” And I was like, “Uh…yeah?” He got me a bicycle gear like I requested, and I was surprised to find there was nothing in the center to attach clock pieces to! I had requested the wrong part for the DIY with no time for mistakes. I tried to think of something good to attach behind the gear so that I could add a clock face and/or numbers and clock hands. I thought about getting a metal sheet, but that would involve also buying metal cutting scissors and the price of the project was starting to grow quickly. Instead, I opted for plexiglass, which the craft store employee said could be easily cut with an Xacto knife. (She was kind of lying. It was not easy, and the edges turned out kind of rough. Lucky for me, the edges can’t be seen because I measured the circle of plexi glass to be slightly smaller than the diameter of the gear). 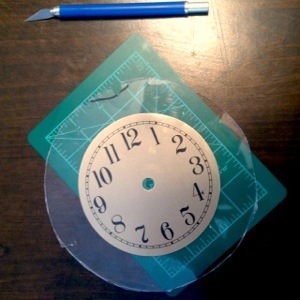 After cutting the plexiglass to size, I tested out the clock face so I could cut out a circle in the middle for the hands and battery. Once again, I didn’t have to make the hole super pretty, because the clock face would be covering the edges of the hole. I tried using a hot glue gun to glue the gear to the plexiglass, but to no avail. This project seemed to be getting more and more difficult! Finally, I got some crazy glue, and that did the trick. 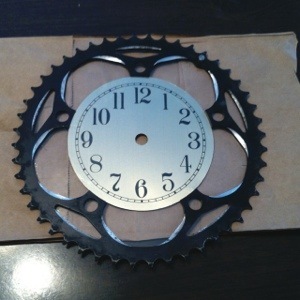 I glued the gear to the plexiglass base, added the clock face, and placed the easy-to-install clock parts. Then, I mounted it on the wall! I was pretty happy with how it turned out, especially because despite the minor setbacks, it was a pretty easy DIY gift overall. The best part is that Chad likes it, too! Did you make any gifts or receive any handmade gifts over the holiday season?